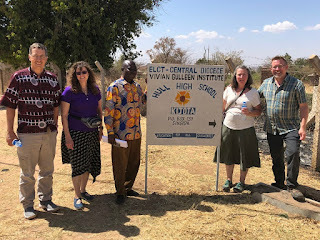 On October 6, after visiting the orphanage, we drove back to Kijota to visit the Hull Secondary School, which had once been called the Vivien Gulleen Institute. Of the five Travelers, only Mark had previous experience with the school, and he told us later that he was very concerned about what we would find. 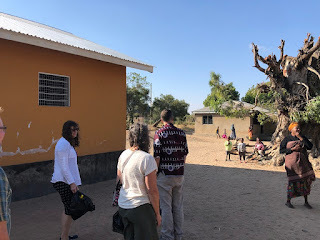 In yet another example of the Suprising Blessings we had on this trip, we found the Hull School very, very healthy and vibrant -- and asking for help because of how much it has grown. A bit of history. Many years ago, when the school was a school for girls, Mount Olive had had a strong relationship with the school. It housed around 30 girls, and Mount Olive members paid for the construction of the Dining Hall (among other things.) Here is that Dining Hall. The school hit hard times, the relationship with Mount Olive was broken for a while, and several years ago, the school found itself with only nine students. On Saturday, October 6, the Tanzania Team Travelers visited two places devoted to children. 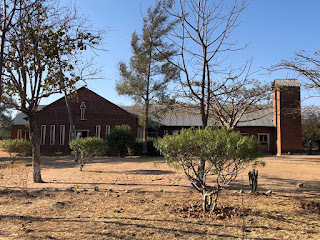 This post is about the first of them, the Kititimo Center for Vulnerable Children. This first photo shows us arriving there. So, what is a "Center for Vulnerable Children?" It is an orphanage, which houses, feeds and teaches children who are rescued from living alone on the streets of Singida, one of the cities in central Tanzania. It serves 14 children right now, and its current capacity is 30. Soon, all of its beds will be filled. The kids had clearly been told we were coming, and several of them were by the remnants of the big tree near their administration building. Before long, most of them were gathered on a rock near the tree, just watching us. One little boy seemed particularly suspicious. On Friday, October 5, while the Traveling Women were working at the Women's Day of Sewing, the Traveling Men went a further 50 minutes down the (very bumpy) road to visit Iambi Hospital. 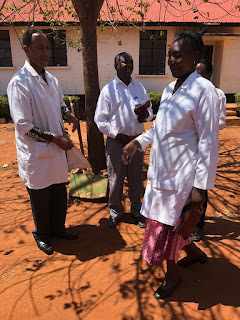 The Iambi Hospital is a private hospital, under the auspices of the Lutheran church, and managed by Pastor Manase Msengi, who is also an attorney. He is in the center of this photograph, where we are meeting several of the doctors on staff. Now before I go on, I want to try to emphasize some important points about the Hospital, which will get buried if I continue with a straight chronological telling of the story of the day. Early on in our Travels, we saw a zebra or two off in the distance. We were excited, perhaps none of us more than Sherry. She really wanted to see zebra on this trip. Bashiri told her she would see many more. True enough. On our afternoon safari into Ngorongoro crater, we saw herds of them, and even stopped in one spot where we were surrounded by them.